We’re delaying our trip to the cabin for a day because thunderstorms have appeared in tomorrow’s forecast. Thunderstorms and helicopters don’t mix. Also, there would be the matter of lugging 1200 pounds of stuff up to the cabin in a rainstorm. We decided to wait it out here in the comfort of Fairbanks and try again on Thursday. I also yielded to an internal weather front and had a meltdown today. It was probably because of all those days in motion without much sleep, plus boat head, then too many errands in town, and all of it awash in a sudden flood tide of hormones. I just got too tired. One moment I was standing in our friend Teri’s kitchen tasked with nothing but slicing a tomato and the next I was in tears. I trundled off and had a good cry and when I reappeared Stewart and Teri were solicitous. “I need (snorffle, snorffle) . . .
“I need (sniffle, sniff) . . . It was an easy need to meet, because guests were coming for dinner, raspberries were on the menu for dessert, and no one had visited the patch all day. 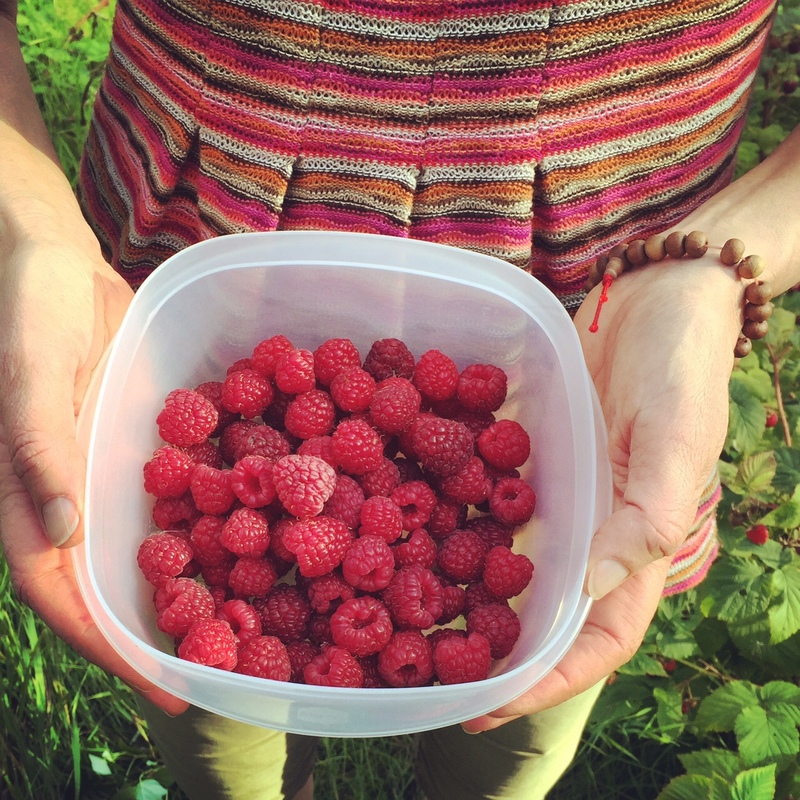 (It’s an amazing year for raspberries in Fairbanks.) Teri put an empty container into my hands and sent me out the door. It was quiet in the garden except for the sometimes chittering of a red squirrel and the sometimes buzzing of mosquitoes before they bit my ankles and the general hum of life in a good green place. Also, while I’m here I want to share a video I stumbled across today. I saw the top of this structure, known as the Dr. Seuss House, from the train on the way up from Anchorage. What some people won’t do for a view! A good cry and picking raspberries sounds like it was just what you needed! You yielded…..
Dear Shae, I so deeply enjoy your writing about your journey. And I love the word (and phenomena) “yielding.” Just hearing it, as well as reading about it makes me soften. Annie, thank you so much for these kind words. 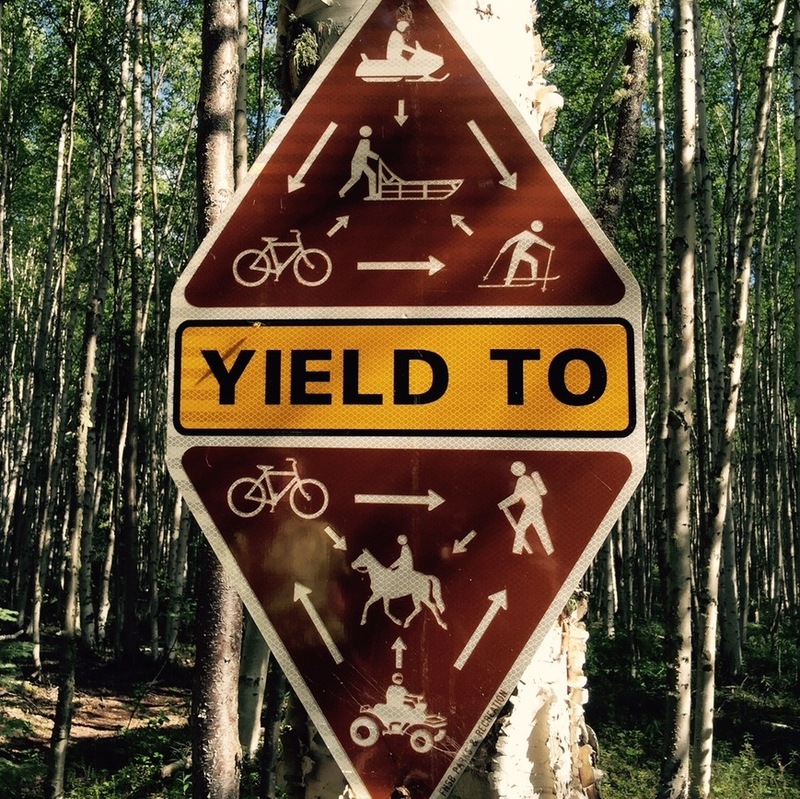 I worked a lot with “yielding” on this year’s trip. Hey, I signed up for your visual journaling class at COM again. I don’t remember what day we start, but I’ll be there! Love this video, stunning countryside, awesome structure. And your story is as sweet as the raspberries. We called it ‘dock rock’. I experienced a little of it after a 6 week cruise (can i still call it a cruise if it was on a research ship?). Most disconcerting, especially when one’s trying to sleep. Isn’t it remarkable? I believe that many, if not most, places in Alaska have no code to conform to other than one’s own — that’s what draws a lot of people to the state. I can’t imagine six weeks on a ship. I don’t know if my brain would ever recover! I’d love to know what you were up to.